Home » Films » Monday Movie Quote: NOBODY’S FOOL. Monday Movie Quote: NOBODY’S FOOL. Paul Newman is an icon, one of the truly great actors. And while he left us with an amazing number of great films, I think my personal favorite is NOBODY’S FOOL. 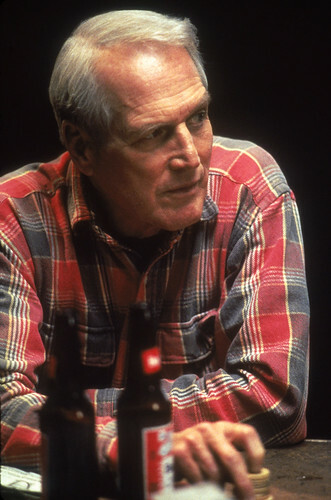 Based on the novel by Ricard Russo, NF was written and directed by Robert Benton and showed Newman doing what few other leading men have been willing to do: Playing their age. The role of Sully Sulivan was a gem and Newman clearly saw that. He jumped at the chance to play this broken-down neerdowell and played infused it with the charm that he was legendary for. This scene takes place in the judge’s chambers. Sully caught the attention of Officer Raymer by driving on the sidewalk. Raymer and Sully don’t care for one another and Raymer decides to show him he means business by firing off a warning shot. After which Sully clocks him. The real hero in this scene is Philip Bosco as Judge Flatt. Judge Flatt (Philip Bosco): Well… here we are again, Mr. Sullivan. Sully Sullivan (Paul Newman): Rotten. Judge Flatt: Well, it doesn’t seem to slow you down much. Doesn’t keep you from punching out policemen or anything. Judge Flatt: Mr. Wirfley, don’t. There are times when less is more,and this is one of them. (Turning to Officer Raymer) Now, then…How are you doing, Wyatt Earp? Tell me,what do you usually do when somebody throws a punch at you? Judge Flatt: Next time, do that. Now, is it true that you discharged your weapon, Officer? Raymer: Your Honor, it was a warning shot. on her commode two blocks away. Chief Ollie Quinn (Jerry Mayer): Your Honor, Officer Raymer is currently under suspension.